This walk follows a B Road all the way around Nigg Bay till you get to Nigg Ferry. I wouldnt be tempted to walk across Nigg Bay when the tide is out as it is a large bay and it is very muddy. Follow the B road through Saltburn until you reach Milton then join the A9 for a couple of hundred yards and cross the road to get to the B road that leads to Arabella. 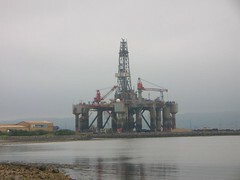 Follow the road to Araballa till it meets the B9175 which you walk along all the way to Nigg Ferry. A fairly long and pretty monotonous road along the northern end of Nigg Bay. 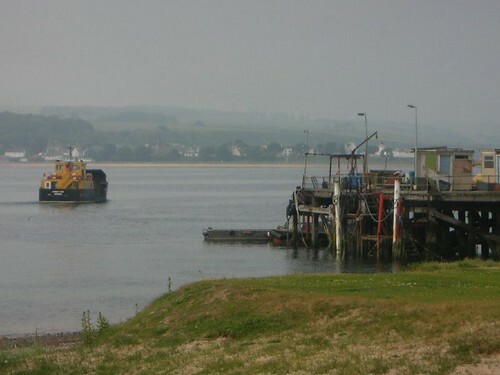 Eventually you reach Nigg Ferry and look across at Cromarty which at most is about half a mile away as the crow swims. Thats when I needed all my resolve not to think that this was a stupid way to pass the time, (which of course it is). Walking around 36 miles of Estuary to get to a point half a mile away by ferry. Still, its exercise and although I will probably neverbe back here, it was good to visit a part of Scotland I have never been to before. This entry was posted on Wednesday, July 5th, 2006 at 11:06 pm and is filed under Scotland, trail, Travel, walk. You can follow any responses to this entry through the RSS 2.0 feed. You can leave a response, or trackback from your own site.